Much has been written about Robert S. Oppenheimer (1904-1967), the famous American physicist and scientific director of the Manhattan project; his charisma and career have inspired a good dozen biographers. One aspect remains little known however: his role in establishing the Institut des Hautes Études Scientifiques. IHES explicitly draws inspiration from the model of the Institute for Advanced Study in Princeton (IAS). This research institute was founded in 1933, Oppenheimer becoming its director in 1947. IHES adopted its basic characteristics – the intellectual ones – as a high level institute dedicated to basic research – and certain practical ones – such as the tradition of tea being served daily, conducive to exchanges of views. Of equal importance was the relationship between Oppenheimer and Léon Motchane (1900-1990), the founder and first director of IHES. As life member of the scientific committee, advisor to the director, frequent visitor and regular correspondent, Oppenheimer played a major role in the crucial early years at IHES. The first meeting between Oppenheimer and Motchane probably goes back to 1948. It is mentioned by Freeman Dyson and commented on by Cécile DeWitt-Morette, who was at the time at IAS. Oppenheimer was its new director and Motchane a -business man, often staying during his frequent business trips with his brother Alexandre Motchane, who lived in Monclair in New Jersey. It was probably through Alexandre, a chemical engineer, that he was able to meet Oppenheimer. But the true beginning for IHES and Oppenheimer’s contribution started in 1958. In the spring of 1958 Oppenheimer was in fact in Paris. He was giving a series of conferences at the Sorbonne which aroused much interest. Motchane met him and organised a meeting with Joseh Pérès. With Maurice Ponte (CSF), Pierre Dreyfus and Fernand Picard (Régie Renault), Motchane was looking for the seed funding required to create his Institute. These very supportive initial contacts enabled him to quickly bring other industry leaders on board (especially in the oil industry). It was however not quite quickly enough for Oppenheimer – who was leaving on 17 May – to attend the founding meeting as Motchane had wished. The notice of invitation to the General Meeting on 27 June 1958 formally establishing the Institut des Hautes Études Scientifiques association nevertheless bore his signature, as well as those of Joseph Pérès, Dean of the Faculté des Sciences de Paris and Paul Montel, the President of Paris Académie des Sciences de Paris. In Pérès’ office, Motchane, a man with a passion for mathematics who obtained his doctorate at the age of 54 and who was responsible for the bulk of the preliminary work, declared that he wanted to “stem the French haemorrhage to the United States”. The Institute was born and he became its first director. He was delighted to announce the fact to Oppenheimer by telegram. Notices soon appeared in the French and American press in the summer of 1958. In the autumn, Motchane visited IAS to see Oppenheimer and also Chicago, to settle the details of mathematicians Jean Dieudonné and Alexander Grothendieck’s recruitment. He had probably approached them beforehand, in any case no later than the International Congress of Mathematicians which took place in Edinburgh. Was Oppenheimer truly convinced by Motchane’s project, in which he had agreed to take part? Whilst defending it in public, he expressed a few concerns in private in 1959. He said that he was hopeful for the possibilities that such an institute could offer to the development of scientific research in France and beyond in Europe and praised the excellence of the mathematics section. As regards theoretical physics, however, he believed that Motchane needed to bring proof of stable funding and to move the Institute – located at that time in two offices of the Fondation Thiers to proper premises. This was needed to establish “the theorem of existence on which everything else depends”, meaning the ability to attract physicists permanently. He declared himself ready to help the Institute in any way he reasonably could. As things evolved and IHES having bought Bois-Marie in Bures-sur-Yvette, in 1961 he seemed more confident and “hopeful for theoretical physics in Europe and in the world”, with IHES finally recruiting its first theoretical physicist, Louis Michel (1923-1999). Visits by Oppenheimer were cleverly -orchestrated by Léon Motchane and reported in the press. Oppenheimer’s presence was an event in itself and his coming to lHÉS gave the Institute important official recognition. 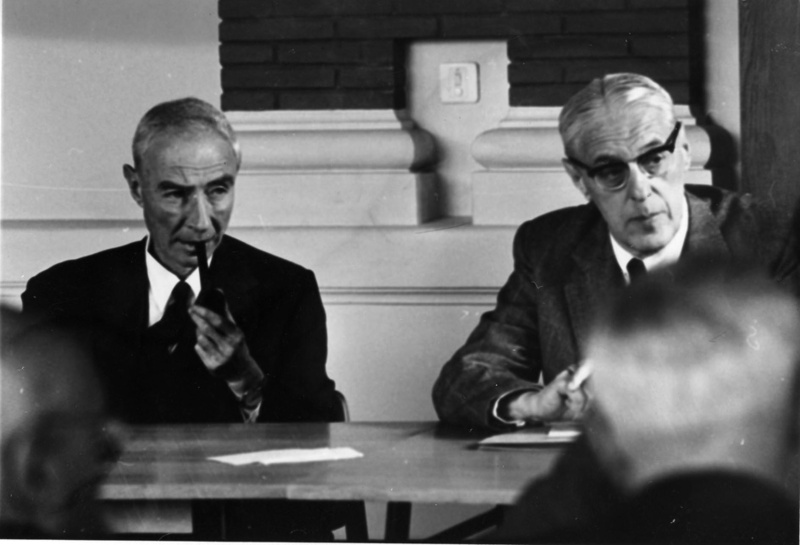 Oppenheimer was to come to IHES three times: from 16 to 19 September 1959, on 17 and 18 October 1961 (in Bures, although the Institute had not moved there yet), and from 14 to 17 May 1963. His last visit, planned for 1965, was cancelled for health reasons. The programme of a visit was planned very carefully to allow for official scientific discussions (meeting of the scientific committee) and for private ones with company directors (French industry leaders, members of EURATOM) as well as meeting with the key players in higher education and research in France. For example, in 1959, he had lunch with Gaston Berger, director of higher education and Pierre Massé, Planning Commissionier. He dined with Pierre Piganiol who was the general delegate for scientific research. He also had time to visit the future Bois-Marie site and to talk with physicists. Each of these meetings was an opportunity for Oppenheimer to speak favourably of IHES and to place it in the broader scope of scientific research development. The Directors of the Board were enthusiastic about their meetings with Oppenheimer. In fact, some of them visited him in Princeton, their status as IHES Board member serving as introduction, when they travelled to the United States (as René Grandgeorge, Managing Director of Saint Gobain, did in 1960, Fernand Picard of Régie Renault in 1961, Léon Kaplan of Société Shell France in 1962). Oppenheimer was a life member of the IHES scientific committee. He was also a theoretical physicist and, as IAS director, came into contact with many other theoretical physicists staying there. He played a key role in setting up the theoretical physics section at IHES. Whereas the mathematics section established itself quickly around Dieudonné and Grothendieck, it was not the case for theoretical physics, even though it quickly welcomed very brilliant and enthusiastic physicists – but none permanently. Gell-Mann, for instance, hesitated for a long time over whether to accept but refused in the end, despite discussions with Oppenheimer and the fact that the terms he had asked for had been met by Motchane. Oppenheimer’s input was decisive in at least three instances including the recruitment of two permanent professors. Relations between IHES and academics had not always been smooth and Oppenheimer was sometimes taken to task. From 1959, Motchane had sought Michel’s advice on invitations to physicists and in 1961 offered him, with the support of the scientific committee, the post of permanent professor. Maurice Lévy, then holder of the Chair of theoretical and high energy physics considered this initiative to be “shocking and immoral” as the offer competed with academia, depriving the university of a good professor and a “research-leader” it lacked. He shared his concerns with Oppenheimer, asking him to use his influence with Motchane to change the latter’s mind. He ended his letter by promising “a bitter battle should that not be the case”. In response, Oppenheimer chose to favour developing IHES. He justified Michel’s recruitment to Lévy, pointing out the entire scientific committee’s endorsement and adding that the decision would on the contrary benefit academia, physics and its consolidation in the Paris region. Nonetheless, Lévy persisted in believing that Motchane’s offer was fundamentally a bad thing and added that Cartan and Schwarz shared his opinion; they leant on Michel to refuse, arguing it would create a precedent. Oppenheimer having passed on Lévy’s letter to him, Michel would explain to Lévy in a thoughtful letter that he saw this post he had just accepted at IHES as another way of organising theoretical physics in France and of paving the way for future cooperation between IHES and universities. Oppenheimer intervened again at the time of David Ruelle’s recruitment. In June 1963, Louis Michel and Harry Lehmann, then both permanent professors of theoretical physics, put forward the name of David Ruelle, who was recommended by Jost and Wightman. However, Ruelle was being sounded out for a post at IAS. Motchane wanted “to avoid at any cost anything resembling competition between the two Institutes” and shared his views with Oppenheimer, who told him on no account to limit his freedom of action and that this did not preclude IAS from making an offer itself. This high level of trust between the two directors endured. Ruelle accepted the post at IHES in September 1963. Finally, Oppenheimer had a very clear vision of developing theoretical physics and of the way it should be implemented at IHES, which Motchane shared: “physics should not be forgotten in theoretical physics”. When the possibility of replacing Harry Lehmann in 19656 arose, Oppenheimer was in favour of recruiting a physicist “concerned with the actualities of present experimental explorations of fundamental physical problems”. He recommended Léon Van Hove – who hesitated for a long time before refusing because of the administrative work he foresaw – rather than Vladimir Glaser, for whom he had great esteem, but who did not fit into the desired development of the theoretical physics section. In the summer of 1958, when the creation of IHES was being announced in the American press, Oppenheimer received a letter from Brakeley, a fundraising agency, asking whether it would be opportune to develop a support group for the Institute. It was only a few years later, in 1963, that the IHES Chairman, André Grandpierre – the Chairman of Pont-à-Mousson, he took over from Joseph Pérès on the latter’s death in 1961 – put this idea to the Board members. This followed the suggestion from an American academic, Irving Michelson, in Nancy for the year. By then, IHES had in fact started to become very well known in the United States and the proportion of American visits had always been very important (around 30%). Before taking a decision, Motchane asked Oppenheimer for his view on the idea, as well as information on the Sam Swerdloff agency they had selected to launch a fundraising campaign: “in Europe, we are not used to this way of doing things” he writes. Having received a telegram from Oppenheimer and favourable reports of Swerdloff, Grandpierre convened a meeting of the Board members on 18 September 1963 at the Fondation Thiers, when they decided to set up this support committee. Swerdloff, having met Oppenheimer, would start by coordinating the production of a brochure, with statements from French industry leaders as well as from American scientists like Wightman, explaining what IHES meant to them. Oppenheimer himself validated the name used for the campaign: Institute for Advanced Study-Europe, which is the English translation of Institut des Hautes Études Scientifiques, but beyond that, recognition of what IHES had become: the European counterpart to the IAS in Princeton. Motchane thanked him: “I am very touched by this analogy, which is a promotion”. Motchane went to the United States in December 1963 and in a few days, enlisted the support of American industry leaders (such as International Nickel, United States Steel, John Manville, Union Carbide, IBM), to whom he was introduced by IHES Board members. The decision of the Inland Revenue Service in the United States on 29 December 1964 allowed tax deductions which had initially been seen as difficult to obtain. Subscriptions, some already acquired from the start, followed. For six years, the American committee contributed up to 10% of the budget, contributions decreasing gradually. The main players of the American committee were Henry S. Wingate (International Nickel Cy of Canada), together with Albert P. Gagnebin (International Nickel Co., New-York), then Harold W. Fisher (Standard Oil Company) and Emanuel Piore (IBM corp.). The two presidents, Wingate and Fisher, took part in the IHES Board (1964, 1969). The existence, the successes of the American committee and its warm welcome enabled Motchane and Grandpierre to approach American foundations, as they did by -contacting Warren Weaver, of the Sloan Foundation, for instance, following a suggestion and an introduction from Oppenheimer. In 1967, the support committee considered a campaign to reach the level of funding asked for by Motchane, or 30% of IHES’ income, matching the percentage of American visitors in the year 1966-67. To that end, the American committee recommended that Motchane launch a similar campaign in Europe, to increase non-French European funding and to boost American investors’ confidence. Unfortunately, the committee struggled. Faced with his failure to find new members, Harold Fisher decided to call an end to the venture. The reasons he put forward to explain the difficulty in renewing membership were the recession, the fact that this was an institute for advanced study, therefore far removed from industry and most importantly, the impression that it was up to Europe to fund IHES, as American industry leaders were preferring American institutions. The dissolution of the committee was decided in the autumn of 1970 and the last cheque received on 8 February 1971. In no way did this mark any downturn in IHES’ relations with the United States, quite the opposite. The following years saw as many American visitors as ever and discussions began with the National Science Foundation, as well as with the National Academy of Science. And surely the creation of Friends of IHES, Inc. in 1999 can be seen as a rebirth of this first American committee! On a broader level, in Oppenheimer’s mind (as we have seen in the description of his hopes for theoretical physics in Europe), IHES truly had to play the part of a European institute. His commitment to IHES was part of his wider activities in the interest of the “European scientific renewal”. His speech during the inauguration of the Synchrotron Proton at CERN in 1960, reported by Motchane, bears witness to this long-standing attachment to European science: “I am among those who owe almost everything of their formal education to Europe, as do many of my generation in our country. We are glad that we can be confident that our children, and our children’s children, will be coming back to Europe for a renewal of the great tradition which binds us together.” But his work was in no way limited to perpetuating an existing European scientific tradition. Paying tribute to Oppenheimer, Jules Guéron, chemist and EURATOM scientific director, wanted to follow “the modern European side of Oppenheimer”, who was interested in all European scientific projects. Indeed, Oppenheimer, like Motchane, took part in the discussions concerning the creation of the European University that European States wanted to see. This project resulted in curbing European contributions to IHES, which would no longer be deemed necessary. Oppenheimer’s opinion was frequently sought and in discussion or letters, he never ceased to make the case for IHES’ existence and the need to fund it. In this way was his input largely instrumental in EURATOM supporting IHES from 1960. Let Léon Motchane conclude with these last words to Kitty Oppenheimer, soon after her husband’s passing: “The image of your husband lives on in everyone’s memory, rich and varied, with everyone finding something of their own aspirations.